The value of child-directed play is universally recognized and one of the few aspects of child-rearing that experts and thought leaders agree on. Independent play makes for highly productive, happily occupied kids, which in turn makes for happier, calmer parents. And it’s natural — the desire and ability to create play is inborn. So, what could possibly go wrong? Parents often share with me the difficulties they’re having establishing the independent play habit for their kids. They tell me their infants cry when they’re placed down, their toddlers won’t play unless parents play with them, or their preschoolers need constant entertainment and direction. Play Myth # 1: Babies can’t do it. Perhaps the most pivotal difference between Magda Gerber’s approach and other child-rearing methodologies is Gerber’s disagreement with the common perception of infants as helpless. Infants are dependent, but not helpless, corrected Gerber. She and her mentor Dr. Emmi Pikler perceived even the youngest infants as capable self-learners, able to initiate play and exploratory activities, experience mastery, engage directly with their environment and participate in communicative mind-to-mind partnerships with caregivers. Brain studies recently conducted by psychologists like Alison Gopnik, Elizabeth Spelke and Paul Bloom have confirmed Gerber and Pikler’s views (finally). Infant minds are now proven to be up and running. But this capable, competent infant is at odds with the more passive infant conceived by Dr. William Sears, influential writer Jean Leidloff and others. In their popular model based on ancestral practices, babies are dependent on their caregivers for entertainment and education and need almost constant physical contact to feel connected. The focus of this approach is carrying the baby as much as possible. Establishing the habit of free play requires a quite different perception and focus — creating a safe play space and trusting the baby to initiate worthwhile independent activities. Of course, infants need lots of attentive holding and cuddling, but in Gerber’s model, they also need play. She noted that infants can clearly indicate when they need to be held, but they can’t enjoy playing independently until we believe they have something to do. 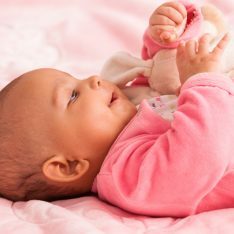 Play Myth #2: If a baby cries when she’s placed down, she must not like playing. The baby is placed down abruptly or without a word. Capable (dependent, rather than helpless) babies are whole people, and they need to be our communication partners. They need to be listened to and also spoken to respectfully about what will happen to them. “Now I will put you down on the blanket to play.” Then let’s say the baby cries. “Oh, you weren’t ready?” The parent might then lie down next to the baby and caress her. “Was that too fast for you? I’m right here for you.” If the crying continues, the baby needs to be picked up but can remain in the parents lap until she feels settled and comfortable enough in her surroundings to try playing again. The baby is used to being carried, propped or positioned. Young children are adaptive but usually prefer to do what they are used to doing. In this brand new world, babies understandably crave the familiar, and they develop habits quickly. Habits like being carried or seated in an upright position often seem to become the child’s “needs”, even though these needs were actually created by the parents’ choices. Developing the free play habit is also a choice. It works best when parents prioritize it by making uninterrupted play the focus of the baby’s “spare time” between naps and attentive feedings and diaper changes. 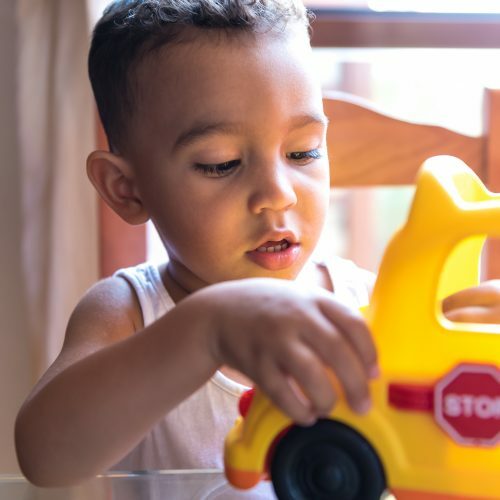 If parents want to make a transition from carrying or propping babies into independent play, the key is to introduce the new experience gradually and responsively with honest communication (“this is different, isn’t it?”) and patience. The parent places the baby down and immediately leaves. No one likes to feel dumped. Parents usually need to begin play by holding the baby while seated on the floor and then stay there for a while after the baby’s placed down. If the parent decides to leave, the baby must be told, or trust in the parent (and in play) can be undermined. Play Myth #3: Play means “doing” something. Often the richest, most productive play doesn’t look like much because it’s dawdling, imagining, daydreaming, big picture thinking. To encourage this kind of play we must: first, value it; second, observe it; and lastly, not interrupt. The secret to not interrupting is to refrain from speaking to children until they initiate eye contact. Side note: Happily occupied babies don’t feel neglected because adults aren’t engaging them (even if several minutes have passed). They know quite well how to ask for attention. Trust your baby. Play Myth #4: Gated play areas are restrictive “jails”. A safe space is essential for fostering independent play. Free roaming babies that follow parents around, even in the most baby-proofed home, don’t focus on play as well or feel as truly free as babies in secure areas. Independent play requires a place free of “no’s” and a relaxed, trusting parent who mostly stays put in order to be the “secure base” young explorers need. Play Myth #5: Independent play means leaving children alone. One of the many positives about independent play is that once it’s established in a safe space parents can usually leave their content, occupied child alone briefly while they do chores, use the bathroom, check email etc. But the most valuable child-directed play is fostered when we learn a new way to enjoy playing with our kids, one that is mostly about observing and responding, less about actively participating. It’s natural to want to interact, but parent participation has a tendency to take over. The more we are playing, the more our child is following our lead, rather than creating and initiating plans of his or her own. Parents often ask me what they can do to wean older children off the play “dependencies” they’ve unwittingly created. Generally, the process is to first believe our child capable and accept “not having anything to do” (and our child’s frustration about that) as perfectly okay. Then, relax, stay put and let the child decide to explore and return to you, let go of the need to please, and keep subtly volleying the imaginary ball back to the child. Play Myth #6: When children get frustrated or ask for help, we should solve the problem for them. As tempting as it is to fix situations for our children when it takes us all of two seconds, we are far more encouraging when we allow frustration, give verbal support, let go of results (since children often don’t care about them as much as we do) and perhaps help in a very small way, so that the child is doing much more than we are. When children ask for help, reflect, and then ask questions. “So, you want to draw a dog? What kind of ears do you want the dog to have? Oh, the kind that point up? Show me what you mean.” You might even resort to allowing the child to move your hand while you hold the pencil, but do all you can to give ownership of play to your child, which also means allowing some activities to be left unfinished. There’s definitely some truth to this one. Bonding through fun with our children is one of our jobs, but if we’ve encouraged kids to love playing independently, playtime together seldom feels like a chore, especially once we’ve discovered the joy of taking a back seat and trusting our child to drive. As my own kids have gotten older, an invitation to play with them is such a rare and precious treat that I’ll gladly drop everything. Come to think of it, I’m often the one asking! It’s amazing how hard that “place free of ‘nos'” is to make! We have a play area/room, it’s as perfect as we could hope for in that it’s very central to the house, but relatively easily gated off. And we’ve done everything we can to make it as safe as possible, but sometimes there are limits in our ability to kid-proof. So we end up with the occasional battle of “nos” in spite of our best intentions. It can be frustrating, not so much because he thinks it’s a great game when I stop him from doing something, but because I know there’s nothing I can do about these issues… It’s like having a fortress with 3 thick walls and 1 open side. Meagan, I think the key is not to get unruffled about it, unless it’s an absolute emergency. If we are very calm about these less safe things they become less interesting to do. It is said that Autistic children go too much into their own world cutting off all communications with the external world by playing with themselves and things. Any thoughts on that with respect to independent play ? How do we ensure that they don’t loose interests in other people and the rest of the world ? That’s a good question, Jayadeep. I’m envisioning a parent or caregiver who is very observant and able to join the child by commenting on his or her activities and interests. But I don’t have the answer to that. I would love to hear what others have to say. It’s hard to change what someone is interested in, but we can let the person know we understand and appreciate her choices. I think that the modeling of respectful language and respectful relationshops is very helpful when working with an autistic child. I have a child with gross motor delay, so some of the things discussed here often cannot apply to him, so I take what is useful and leave the rest. But I specifically internalize respectful language, trusting the child, and working together as a team. First of all, I would follow the recommendations of your early intervention team around limiting fixating and stimming behaviour and encouraging naming feelings, regulating feelings before they become too much, and continue working with the tools provided to you by early intervention. Secondly, and these are my own insights: While I did not work in ECE but with adolescents, some of my kids were autistic or on the spectrum. It was helpful to engage in play WITH the child or engage in parallel play with the child as close as tolerable (to the child). If not, then watchful waiting is helpful, too. You can sit beside the child, keeping your body language very neutral, and just be in the moment, occasionally verbally acknowledging what is happening. This may not result in a child noticing you, until the day they do. I would say, “I see that you like these legos. I enjoy seeing the things you make.” Later this could becomes requests for things (with older children): “I see you are making a boat? Can you make me a boat, too?” With high functioning autistic kids, I gained a lot of ground doing this, working with what they enjoyed, but it is always important to have that relaxed attitude and back off if the social interaction is too much. Like Janet says, “Like a CEO”. You will notice when it becomes too much before it results in out of control behaviour, because each child has his or her own set of small cues they give off before a full blown event happens. I was known for being one of the staff who never had an escalation or had to call for back-up. I was just good at learning a child’s cues. Watching. And somehow skilled at finding a way to do therapy or learning work that accomplished the goals of a session without compromising trust and the relationship– a lot of people put the work first, and forget about the relationship, and end up using coercion and punishment and rewards. Not necessary. This is something RIE is very useful for. While it can sometimes can be rigid in its application, the core beliefs offer the parent some very critical advice: watch and observe; wait before reacting; treat the child as a subject, not an object; know your own child; communicate EVEN WHEN you may not find it returned; and communicate AS IF understanding is present (thereby modeling language and social skills). All of these things are useful when working with a child who is autistic. But I did not work in ECE so I cannot apply it for you as if I had specific experience. Maybe someone else has some thoughts? From a parent of a child with some challenges, I can’t say enough good things about early intervention when combined with the respectful philosophy of RIE. I would say to not get too hung up on the specifics, but more, think about the overall lessons taught here and then apply them to your necessarily unique situation in concert with your early intervention team. Encourage them, if they do not, to use respectful methods and language, and to remember not to do TO the child, but do WITH the child. Jayadeep, I was taught in the DIR/Floortime approach begun by Drs. Stanley Greenspan & Serena Weider. It is basically observing the child and learning their individual profile, needs, style, challenges by observing, getting down on the “floor” with them… and then joining in with them at their level, exactly as they are and where they are… not trying to change what they are doing. Over time you build a relationship of love and trust with that child and that bond flourishes. You play what they are playing and slowly expand upon what they are doing to help them move up the developmental ladder. It is an interesting approach. I thought it was fabulous especially for children with significant developmental challenges, and I loved the way it focused on that child so individually, and on the relationship between child and caregiver as well as the child’s interests as the catalyst for developmental progress. We saw this approach work marvelously with our older son who had some of those needs. Our younger son is doing very well with RIE. I’d suggest looking into some of the DIR/Floortime info especially for children with autism and other significant developmental disorders. I completely agree about children being able to direct their own play and feel empowered. I was wondering though about our expectations of children and the ‘right’ balance for them in relation to independant play along similar lines to Jayadeep. 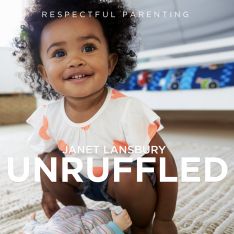 When a child (like mine) is at home most of the time with one parent I wonder if it is so great for him to be expected to be as independant as your blogs seem to suggest (which maybe more about the way I’m reading it) they ‘should’ ideally be Janet. I have thought about this a lot recently, particulary as my son has got a little older (now 3.5) his desire to have one of us play with him has increased more and more and I went through a time of judging myself and thinking that I had created a demanding needy child (and I had never seen him that way at all before, quite the opposite). But when I really thought about it, I thought, well why wouldn’t he want to be social and interact and have play mates? And when I put it in perspective too by noticing the different expectations we parents can have of children, like the fact that if he had a sibling and they played together all day I would think that was lovely and great but when a child wants to play with an adult that is somehow different. If our modern way of living didn’t have us living in nuclear families that are somewhat isolated then we wouldn’t value all this independance as much as we would value the ability to connect and co-operate and be part of the community. So for myself I have come to peace with my sons desire to interact more and more. We recently hired a nanny 2 mornings per week so he can have another playmate and so I can do some work and the first thing she said to me about him when we got a moment to chat was something like, “He is very self directed. He knows exactly what he wants to do, so I haven’t found it helpful when I suggest things to him” (I had suggested she introduce him to some activities that I may not so much like crafty things)… “And sometimes all he really wants is company while he plays, to know I’m there with him”, she said. I’d love to hear more Janet on your expectations and beliefs around this, like how long would your children have played alone/independantly at certain ages. I’m sure Janet will have a good answer, but to me the key difference is “self directed” vs “alone.” Have you ever watched the documentary “Babies?” the baby in Africa has pretty much constant self-directed play going on, but he’s never alone. I don’t think it’s a question of over-valuing independence due to our isolated society…. I think we just need to be more careful about how we define independence. Hi Katinka! All children are different and I don’t think there are “shoulds” about play at all. It sounds like your boy is self-directed. Some children do like company more than others do…and, as you say, he is learning a lot through these social interactions with you. Don’t judge yourself! I tried to make the point in this post that’s it’s not about being alone, it’s about the ability to self-entertain. It’s about trusting and enjoying the one person we’ll always have with us. It’s about enjoying interaction with others, but not always needing them. It’s about what works for you and your family! To answer your questions about my kids playing alone. My two daughters were much more into playing alone at all ages than my son has been. They would play for hour long stretches or more, but there were times they needed more interaction and would let me know. My boy is the youngest and has always been hugely social. He is a team player in every sense of the word and has a ton of energy. He would probably always much rather play with someone, but he can stay focused on an activity for a very long time. I believe that is because we have allowed him to lead play, been careful not to interrupt when he is occupied, and kept screen use to a minimum. Another great post, thanks! I have been practicing a number of RIE approaches since finding your blog and I am very happy with the result. I do not see them at odds with Dr Sears and also love wearing my baby. I believe that it is because I respond to my baby’s needs and carry him on the sling when he needs the closeness, that he is happy to play independently. He trusts me to pick him up or be there when he needs. He used to play for quite long stretches of time, fascinating to watch! Now that he is crawling and pushing himself up I seem to have become his favourite climbing object. What do you normally use with kids at this stage in RiE classes? Thanks! Sounds great, Monica! In the RIE classes we have large wooden cube-shaped “blocks” that are open on one side, so the child can pull up on them, and also go inside… We usually place play objects inside. At home my kids used a coffee table and shelves that were bolted to the wall. Enjoy! How about babies with reflux who can’t be flat on their backs? Any advice on how to help them with their play time? Cristina, the reflux definitely presents a challenge for free movement in the first months. I would try to capitalize on the times of day when the symptoms are mildest, like before rather than after feedings. I am very blessed with a little one who seems naturally good at independent play (although we have also done our best to encourage her in this skill). She loves to occupy herself with her own experiments with her toys for a length of time that many consider amazing for her age. Regarding the first bullet point, is there any relationship at all between Magda Gerber and Francoise Dolto? I was reading a book which mentioned Dolto’s parenting philosophies, and it sounded so much like what I’d read of Gerber that I wondered if both had a common intellectual heritage or if there was any crossover in ideas. Both seem to emphasize respecting babies (a point that I love, love, love) and communicating clearly with them from a young age. Maybe it’s just that what they both say is so TRUE and they both learned and taught it. Now there’s a name I haven’t heard before! I will have to check her out. Thanks, KT. The recent book Bringing up Bebe (think that is the US title – called French Children Don’t Throw Food in the UK) talks extensively about Dolto and many of here ideas reminded me of RIE, so if you want an intro that might be a good place to start, although no idea how accurately it reflects her philosophy! Janet, Once again an EXCELLENT post that I will be sharing everywhere! It certainly has sparked a great discussion as well! Parents (and babies!) are so fortunate to have you share your knowledge and heart! Thank you, Deborah! It’s wonderful to have the corroboration of someone who understands the developing brain as well as you do. There are so many misunderstandings out there… I appreciate your support! You’d be a welcome stalker, Sharon. Support and trust who she is. She may be a more introverted person, or she may have other reasons she’s not ready to join in for the moment. Again, trust her, she knows what she’s doing. And in the meantime, playing beautifully by herself is a wonderful thing. Janet, This is an outstanding piece of work. Not only the wisdom about children, but the collection of research, and comparing with other approaches. You are one of today’s leading psychologists. …and you helped me rediscover Paul Bloom. I love the videos your link leads to. Required listening for all humans. You should start writing your video’s: today on the floor with the babies. Tomorrow in front of psychology students–no, skip that–go directly to the masses. Aww, I so appreciate your encouragement, Rick. And I agree about the Paul Bloom video. So love your work. RIE parents have such a head start. In this post, I especially appreciate you dispelling the myth that “Play means “doing” something.” the play that children “do” might sometimes look like nothing to an adult but, as you said, it is far from nothing! This point alone will help parents raise children who know the difference between busy and fulfilled. “This point alone will help parents raise children who know the difference between busy and fulfilled.” Love that, Sandy, thank you. Thank you, Gauri. I really appreciated your article about encouraging play. I have been having an issue with my daughters independent play for the past couple of months and I am not sure how to approach it. Since I discovered the RIE philosophy when my daughter was 4 months old, her play has always been self-directed, and I have watched her play very focused and independently for very long periods of time since then without any adult direction. She is a very inquisitive, determined, and focused child which I believe is the result of her being given endless opportunites to play independently. She is now 19 months old, and for the past couple of months all of her energy has become focused upon books. She loves books with a passion, and wants me to read to her book after book literally all day. I really do not want to stifle her love of reading, and I am very happy that she loves books so much, but honestly the routine of reading to her all day has gotten tiring for me. I have tried removing books from her play space and keeping them in one room, but as soon as we go to her play room, she will tolerate it for few minutes, then says “book book book” over and over again until we go to the room where the books are kept and she is able to pick one out. I have also thought about scheduling reading times throughout the day, but I am just really worried that a schedule might discourage her love of reading. Any advice is appreciated! How wonderful that she loves books so much! My daughter is also a bookworm. One thing that helps us is for her to have books available that she can “read” herself. She does generally prefer to have me read books to her, and we do a lot of that, but I also will tell her, “This is the last book I’m going to read to you before rest time [or whatever]. The next one you get to read to yourself.” During her rest time she will read many books to herself this way. So I’d say: put the books back in your daughter’s play room, but make it clear that books don’t need to be mediated by you. I would love some tips on toys, furniture, items to help set up a safe play space. For example, your climbing apparatus that kids god “stuck” and “unstuck” using. Or good floor coverings that you use. Your child-sized table. Etc. I have a daughter who is quite self-directed in her play, but she doesn’t adhere at all to the general principle you state about kids being less focused on results than we are. My daughter has exhibited perfectionistic tendencies from very early on, and she does not tend to walk away from tasks that are too hard for her (or where her vision of what she want to do is not in line with the basic laws of physics) — rather, she tries and tries, and eventually gets extremely frustrated (screams, throws things). Even then, she often does not want to stop the activity. I do understand that not all frustration is a bad thing, and I try to keep my own comments process-focused, and descriptive of what she is doing. I do remind her that she can walk away. But that does not happen. It ends up often that I need to intervene to prevent the frustration from exploding (things getting thrown). I try to avoid intervening in ways that solve the problem for her, and I think I’m better at that than I used to be, but that generally means that I will end up needing to intervene to manage or contain an explosion (things get thrown). I’d love to hear from anyone who has spent time with children who are similarly intense in their pursuit of mastery. How does one strike a balance between accepting frustration as something she should experience (I don’t think of it as all bad) and helping a child become more flexible with her vision of what she wants to accomplish? Margarita, your daughter’s strong personality will serve her well. Since you say you are “getting better” at not solving your daughter’s problems for her, there may be some residual effect of your past responses at work here… In other words, if you were solving problems for her, she may believe these problems need to be solved, whereas another child might be more accepting of them left unsolved. Does that make sense? That’s generally the approach I have been taking for most of the past year (though I’m not always quick enough to stop the throwing, if I’m, say, cooking dinner at the time). I have also sometimes disappeared a toy or object that seems to repeatedly bring out that angry frustration. For example, when she was about 11 months old and was determined to put two blocks together, but simply couldn’t manage it, and just got frustrated and angry. (Even then I didn’t put the blocks together for her, and I don’t think she would have wanted me to — it was about the mastery of it for her, not about having the blocks joined) When I gave her the blocks again a few months later, they were still a challenge, but a conquerable one. But I have mixed feelings about that, because there is a sense in which it’s not putting her in a position of dealing with/moving on from the lack of “success” from her perspective. I think I probably also continue to give occasional guidance that I see as akin to what you mentioned in a previous post about surreptitiously loosening a jar lid just enough so that a child can work at opening it and have some success at it — not in every situation, but sometimes (particularly if she is overtired or there are other physiological signs of distress independent of the activity). I think I probably need to be even more sparing with this, as I don’t want my daughter to miss out on the learning that happens when she confronts obstacles that cannot be overcome (or that need to be imagined differently to be overcome). That kind of learning is so important. Thanks for thinking with me about all this. Yes! I think the Educaring approach and realizing that our babies are thoughtful individuals really frees parents and caregivers, you know? 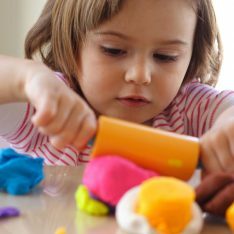 The idea that our very youngest infants can play independently, that they are capable while also dependent, allows us to see them in a different way and gives us more freedom – freedom from being their only means of entertainment, freedom from worry (am I doing enough, am I doing it right? )- and gives us the chance to be *with* in partnership instead of just serving. Thanks so much for this fantastic blog. I have spent the last 3 years feeling guilty about not spending every possible minute playing with my children even though deep down I know that it can’t possibly be healthy to entertain them every second of the day. I love my children and enjoy their company so much, but it is exhausting to constantly feel guilty for having to do housework, or for wanting to sit and have the occasional cup of coffee on my own. Its just so refreshing to read that it is okay, and actually beneficial to just let them be. I’m putting down the guilt, going to grab a coffee and am going to enjoy just letting them play. Think of it this way, too, Aanika… Your baby is learning that loved ones (who will be the model for all your child’s future relationships) have healthy boundaries, which means she will respect the boundaries of others and also be empowered to establish her own. Thought this article was relevant here. The researchers found that helping a baby sit up may be useful. Useful? Only if you don’t trust your baby to choose this position (or any other) on her own. This reminds me of the “tummy time” research… YES,YES,YES, babies need to spend LOTS of time sitting, AND on their tummies AND crawling (which they CAN’T possibly work on if we strap them into a seat or stick them in a seated position before they’re ready). Each of these positions and movements is vital to healthy development, very important for learning, yes, yes, yes. And babies choose every one of them and assume them for GREAT periods of time when they are ready, totally of their own volition. They don’t need parents or scientists doing things to them. All they need is time to move freely, play and self-direct development. The studies make perfect sense, but NOT the ridiculous, unnatural implications these researchers suggest. They are frankly ignorant about the natural ablitites of babies and base their conclusions on ZERO belief in nature and children. Sorry for the rant, but the implications assumed from these studies drive me crazy. Anyone who has spent an hour observing infants who have been given free choice to move as they wished would realize that babies know about a zillion times more about their development than these supposed “experts” do. Dasa, it sounds like you are misunderstanding the RIE approach. If your daughter is crying, RESPOND verbally immediately, address what you perceive as her need and comfort her. Talk to your baby. Ask questions. You mention pain… if this is gas or intestinal pain, sometimes a light tummy massage is very helpful, and more milk isn’t. But it is very hard to discern these things at first! There will be a lot of “mistakes”. That’s okay! So please be patient with yourself and your baby while you learn to communicate with each other. I adore the loving respect of the RIE approach. Also adore that you explain it with loving respect. Regarding Play Myth #4; my son is 15 months now and although he loves to play by himself he also spends a lot of time wondering around the apartment, checking things out and following us when doing our daily chores (cooking, cleaning, etc…). Should we re-implement a gated area to encourage more independent play? For how long do they need actual gates? My son is 13 months and I have always loosely followed RIE with regards to playtime – I let him do what he wants and not forcing him to learn anything. He has picked up a few things – how to use telephone, comb his hair, look below the couch & table for his ball and trying to find out it when it rolls away. However, I feel like sometimes I dont’ spend enough time with him because I am with him all day. He will go to his room to play for a bit. But for him the playing consists of dropping all his toys from their boxes, dropping all the books and then moving on. Should I just let him be or try and guide him? Videoing and taking pics also interrupts play and makes kids self conscious. Also makes them believe that anything they do is spectacular and requires praise, acknowledgement and display. Flip side of that is, if no video or pic is taken when they want it, the action / idea is not worthy enough . I think this is a important point, Faheemah. Excessive videoing and pic taking also requires being “not fully present” to the situation. Children, as well, may begin to pose and focus on approval, instead of being engaged in their play. Wow, what perfect timing! My daughter is two months old and we have both been frustrated over play lately. I knew independent play was important but I did think if I put her down and she cried that meant she didnt want to play. I do always observe before picking her up but she was making it clear she wanted me to pick her up. It never occurred to me to hold her and get her used to her surroundings and try again. Thanks Janet! Thanks for this post – I know it is two years later, but it has soothed my conscience a bit. Both my husband and I work from home with our toddler and I really feel guilty for not playing with her a lot. She basically entertains herself all day long in a safe area just next to our office, where we have eye contact with her all the time. It is a real challenge to make things work and our finances are extremely tight, which is why we need to take on more work than we can sometimes handle. All other babies I know are in daycare, and I feel guilty that I don’t give my daughter the same stimulation (playing games, singing songs, building blocks with her). I would read her a book now and then or play flashcards with her and she gets plenty of hugs and cuddles when it is diaper or feeding time, but this only accounts for a few minutes at a time and for the rest she is left to her own devices. She is mostly content and would complain and ask for attention occasionally, but for the most part she plays by herself for hours. I was just afraid that this might be unhealthy and that it is impairing her development, and have seriously been considering putting her in a daycare so she can socialize and play with friends, but there is simply no money for that. She is very friendly towards people, by the way… doesn’t really show any signs of seperation anxiety at all. My 2 year old daughter has been home with me since birth and plays really nicely independently. However, when she is with others, my husband, grandmother, requires more constant attention. I’m not sure what to make of this. another thing to add, sometimes lately she will say “where’s daddy?” or “where’s nana?” when we are home. We are expecting a new baby soon but she has never said those words until recently. She still plays nicely independently and acts the same mostly. So my 9 month old is great at playing on his own, but I don’t know what to do while he plays. I feel guilty for not playing WITH him more, but he happily entertains himself for the most part. I get bored sitting watching him, but don’t like getting started on something that will completely take my attention away from him. So I find myself pulling out my phone while I sit with him because that doesn’t seem as distracted (though I know it is.) Can you help me? I want to be present and have him bond with me, but also sustain this independence. Take as many breaks as you like, but be honest with your child about them. “I’m going to be looking at my phone now for a little while.” It is not only more respectful to be honest, but also encourages children to play in a more focused manner. It’s harder to focus when you are wondering whether or not you have your parents attention at any given time. Hi! I think there is a typo up there on #6! Should it not say ” should NOT solve the problem for them”?! We have been firm believers in yes spaces and independent play since my son was a tiny infant. We lived in a very small apartment and gave him a large enclosed yes space, relative to the tininess of the apartment. Now we live in an apartment double the size, and his yes space is his entire bedroom. My question relates to enclosed areas – as a first time mom of a kid who has been “enclosed” as long as he’s been mobile, i’m having a hard time trusting his progression towards being able to access the open areas of the apartment. At 14 months he’s very interested in opening doors/drawers, climbing on everything etc. and it makes me a bit anxious when he explores! His dedicated play time is still in a gated area, but I would love to relax a little more with him having time to see the rest of the apartment and feel some kind of ownership of other parts of his living spaces. Thank you! You’re so welcome, Dess. It’s great that you understand that your baby is capable of entertaining herself. My recommendation would be for her to be left on her back so that she is free to move her limbs and twist her torso, and work on rolling, pivoting, scooting, etc. It’s best not to restrain her in an upright position. You are right and i think every parents should to know this and apply it with their children. Personally i always follow the number 7th that It’s our job to entertain and play with our children. Thanks for the sharing your valuable opinion here. I didn’t discover RIE until my daughter was passed the infant stage. I wish I would have incorporated more of your principles! If we have another one… I’m wondering about infants having too much time on their backs. It seems like this quickly becomes a concern with too much time on their backs to sleep and play – creating flat spots on the back of their heads. Any thoughts on this?